ImageQuantify.com has created online tools for preclinical image analysis, data aggregation, and documentation within its secure web platform. This release is of interest to discovery, preclinical, and basic research professionals or executives currently conducting or planning to conduct studies targeted at quantifying cell migratory characteristics. ImageQuantify.com, an online automated platform for quantitative preclinical imaging analysis and data aggregation created by ImageIQ, today announced the addition of the Cell Invasion Analysis IQbot to its publicly available collection of image analysis and documentation research tools. This new IQbot quantifies the density, distance, and aggregate area of cells that have migrated away from a collagen plug into a surrounding matrix. “IQbots” are the engines that power the ImageQuantify.com analysis and management workflow — tools for common or custom preclinical research imaging assays that deliver validated, comprehensive data that are completely objective, reproducible, and accessible online. Within every IQbot results package researchers receive complete data (i.e., quantitative excel spreadsheets, image analysis overlays, usable file formats), individual image validation certifications, and reference materials (e.g., a video walkthrough of output data, relevant references from scientific literature, methods sections, material supportive of GLP compliance, and a validation certificate). 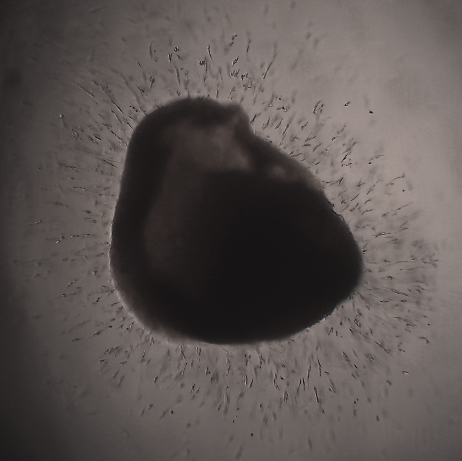 A Cell Invasion Analysis (also referred to as a Boyden Chamber Assay or Collagen-Plug Migration Analysis) is a common and useful tool for measuring the extent to which experimental conditions impact spontaneous cell migration. To arrive at a quantitative measure of migratory activity, the IQbot segments all cells outside of the plug edge and within the invasion boundary to determine the invasion distance and area, as well as the cellular density in that region. In addition to the quantitative metrics generated, a pair of pseudo-colored output images are produced. The first output image consists of segmented cells, the invasion boundary, and the collagen plug edge pseudo-colored green, red, and blue, respectively, and superimposed upon the original image. 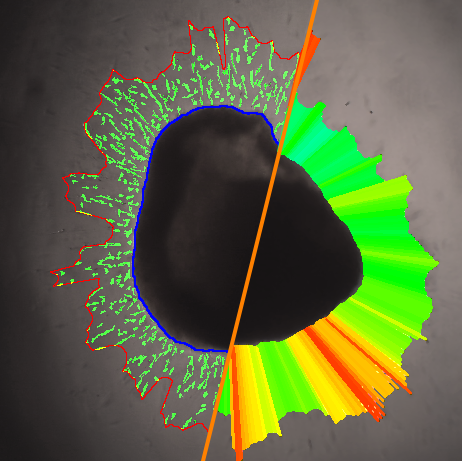 Similarly, a second image is generated in which cell distances from the collagen plug to the outer invasion boundary are pseudo-colored with a blue-red heat map that is tied to a global calibration scheme for quick comparison between different images in an analysis set. For further detailed info, watch this 12-minute Cell Invasion and Migration Image Analysis Mini-Webinar @ http://bit.ly/1qohGX6. This IQbot will join the existing ImageQuantify.com catalog to assist researchers in more effectively (e.g., better and broader data) and more efficiently (e.g., improved cost and time-to-analysis) generate imaging data for their research. As with all prior offerings, the Cell Invasion Analysis IQbot was developed and released following a rigorous testing and validation process stressing the accuracy and reproducibility of the output data. ImageQuantify.com software engineers are consistently building new IQbots to add to the processing catalog. To prompt prioritization of an IQbot for their own analysis needs, researchers may submit requests to enter the “IQbot Incubation Program.” Researchers submitting requests will receive a notification within 10 business days identifying whether or not their assay has been chosen for development. This decision relies on estimates regarding the time and technical resources required to develop, test, and validate the IQbot, as well as the IQbot’s potential impact on the overall scientific community. Created by ImageIQ, ImageQuantify.com is an online quantitative image analysis service for preclinical research. Using secure cloud technology and the ease of e-commerce, ImageQuantify.com provides validated and automated image analysis software tools for common preclinical imaging assays. As a result, all preclinical researchers may now take advantage of accurate, reproducible, objective imaging analytics that are both affordable and easily accessible. ImageQuantify.com’s preclinical services are backed by the technology and experience of ImageIQ, Inc., an Imaging Contract Research Organization (ICRO) that specializes in providing image management software, image analysis capabilities, and professional services for imaging in drug and device clinical trials. ImageIQ is a Cleveland Clinic Innovations Company.